- Choleliths (gallbladder stones) are thought to form due to imbalances in fluxes between bile salts and cholesterol that maintain a liquid composition to bile. Resultant change to a thicker, or congealed form of bile provides scaffolding for the deposition of cholesterol, bilirubin, or calcium salts resulting in the formation of choleliths. Other factors thought to promote cholelith formation include increased cholesterol or triglyceride levels, altered gallbladder motility, bile stasis, and biliary inflammation. 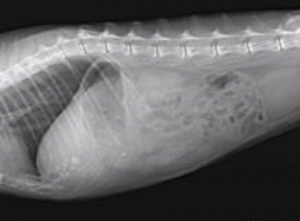 - In the cat, choleliths may contain precipitated calcium, cholesterol or bilirubin. In one study of 9 cats with choleliths (JAAHA 2002), the most common type was calcium carbonate. Middle aged to older cats are affected more frequently. - In the dog, choleliths are usually composed of cholesterol or bilirubin. Calcium based choleliths are less common. Choleliths are more common in the older female, with increased incidence in the Miniature Poodle and Miniature Schnauzer. - Choleliths can vary in size (from millimeters to centimeters), number (most patients have more than one), and location (in addition to GB, some patients have choleliths move into the common bile duct –choledocholiths). - Calcium carbonate stones are yellow in color and hard, bilirubin stones are usually brown or black, and cholesterol stones tend to be softer in composition, and tan in color. What clinical signs are noted with cholelithiasis? - Many patients with choleliths are asymptomatic with stones found as an incidental finding on abdominal radiographs or ultrasound performed for other reasons. - In other patients, choleliths may be associated with concurrent cholecystitis or cholangiohepatitis. In a 2002 JAAHA study of 9 cats with choleliths, 7 of the 9 cats had concurrent cholangiohepatitis. In patients with cholecystitis or cholangiohepatitis, signs of fever, malaise, lethargy, vomiting, abdominal discomfort, and anorexia may be present. - In a smaller percentage of patients, choleliths can cause biliary obstruction and signs of extrahepatic bile duct obstruction or rupture. These patients typically have signs of significant illness, fever, abdominal pain, and icterus. - Choleliths are most commonly detected on abdominal radiographs or ultrasound. As not all choleliths are radiopaque, ultrasound is more sensitive for detection. 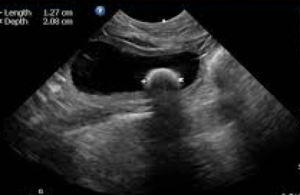 - Ultrasound is a critical modality in the evaluation of the patient with cholelithiasis, as it allows for detection of comorbid conditions that dictate treatment. Patients with gallbladder wall inflammation or thickening noted on ultrasound typically have concurrent cholecystitis and cholangiohepatitis. Patients with secondary biliary obstruction or stones within the common bile duct may exhibit dilation of the common bile duct, intrahepatic biliary distension (within 5-7 days), marked inflammation in the mesentery surrounding the gallbladder, and pockets of fluid nearby (suggestive of potential rupture). - Screening labwork can vary from normal (in the patient with incidental choleliths) to elevation in liver enzymes (ALT, SAP, GGT) and bilirubin in patients with concurrent cholecystitis or liver disease. Patients with obstructive disease or biliary rupture can have more marked changes in liver parameters (greater increases in cholesterol, bilirubin, SAP and GGT). In these patients, other findings such as mild anemia, leukocytosis, low albumin, and electrolyte abnormalities may also be present. - If the patient is asymptomatic, labwork is normal, and choleliths are incidental, then benign neglect is reasonable. Monitoring ultrasounds should be considered given the potential for future GB disease and movement of choleliths. - If the patient is symptomatic with malaise, abdominal discomfort, and elevated liver enzymes, but no overt obstructive disease is present, then supportive therapy including fluids, analgesics, anti-emetics, denosyl, ursodeoxycholic acid, and antibiotics are indicated. - In one study of 29 dogs with cholelithiasis (JAVMA 1993), 15 of 20 bile cultures were positive. Two JIVM studies in 2016 showed Escherichia coli, Enterococcus spp, and Clostridium as the most common isolates from bile. Antibiotic therapy should ideally be based on culture and sensitivity results and given for 4-6 weeks. Cholecystocentesis (aspiration of the gallbladder) for cytology and culture can be considered to accurately guide therapy. Complications can include gallbladder rupture, and the decision to obtain samples must be evaluated in light of GB appearance on ultrasound. A JIVM 2016 study of dogs and cats undergoing cholecystocentesis (140 samples) showed efficacy in detection of causative organisms with complication rates of 8% in the dog and 1% in the cat. - Additional hepatic supportive measures include use of denosyl (with anti-oxidant and hepatoprotective properties) and ursodeoxycholic acid (Actigall) to help promote bile flow and reduce hepatic inflammation. Actigall is contraindicated if biliary obstruction is suspected, as it may promote biliary rupture. - If biliary obstruction or rupture is identified, then immediate surgical intervention is indicated. At the time of surgery, bile should be obtained for cytology and culture, and choleliths submitted for analysis. Dependent on the location of obstruction, and co-morbid conditions, different types of surgical procedures (cholecystectomy, cholecystotomy, other) may be indicated. In patients with choleliths causing obstruction of the common bile duct, choledochotomy is often indicated. In patients with additional complications, more complex biliary diversion procedures may be needed. Cholecystectomy is reported to have lower morbidity than cholecystotomy. - The prognosis for patients with choleliths is variable and dependent on associated signs (aclinical vs concurrent cholecystitis or cholangiohepatitis). Medical management is usually successful in treatment of clinical signs. - Morbidity and mortality is greater in those patients with biliary obstruction or rupture that undergo surgery. In the 2002 JAAHA study of 9 cats with choleliths, 7 had a mean survival time of 24 months after surgery (5 of 7 had cholecystectomy performed). In the 1993 JAVMA study of 29 dogs with choleliths, the survival rate was 86% with cholecystectomy versus 50% with cholecystotomy.